On Sunday, November 15 nearly 150 guests gathered at Buccan for the city’s premier culinary event for a cause – the Palm Beach No Kid Hungry Dinner. 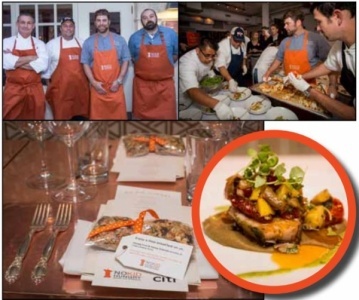 The reception and five-course dinner, which featured local and guest chefs, raised more than $133,000 to support No Kid Hungry’s work to end childhood hunger in America. Guests were treated to moving remarks from Share Our Strength President Tom Nelson, a festive live auction, and an exquisite menu of grilled Maine lobster, risotto with shaved white truffles, local swordfish and roast lamb. One in five children in this country struggles with hunger, including more than 64,000 kids in Palm Beach County, Florida. No Kid Hungry is ending childhood hunger in this nation by ensuring that kids start the day with a nutritious breakfast and families learn the skills they need to shop and cook on a budget. Since the campaign’s launch, No Kid Hungry and its partners have connected kids struggling with hunger with hundreds of millions of meals. This year, the Palm Beach No Kid Hungry Dinner at Buccan raised more than $133,000 to help feed children in need more than 1,330,000 healthy meals. Share Our Strength’s No Kid Hungry Dinner Series is supported by national presenting sponsor Citi. Local sponsors included Nadine Allen and Sanjiv Sharma, Jill Viner, Marcia and Alan Docter, The Seremet Family Foundation, and Palm Beach Wine Auction.